It might seem curious to be reviewing a book that was posthumously published more than twenty years ago. Curiouser still, that in this age of the dismissal of the working class as a force for change this book deals exclusively with working class, predominately Jewish, life in the East End of London in the years between the first and second world wars. Such scepticism is entirely misplaced, because the book is a fascinating chronicle of working class existence in that period and is something of a socialist classic. Joe Jacobs was born in 1913 in the East End of London. He lived and worked in London and was involved in socialist organizations his entire life. Joe was a member of the Young Communist League, before he joined the adult party from which he was expelled not once but twice (no easy matter). He was later one of those who helped to found the libertarian socialist organization Solidarity (the UK not the US version), and after being expelled from that, was a founder of the network Echanges et Mouvement in 1975. To be honest the book is a slow read. Not because the language is difficult to read or the subject matter is dull; on the contrary, the book is straightforward and written in plain English, unlike much left reportage, but it is a thorough book. I read slowly because the wealth of detail threatened to overwhelm me, and I was afraid I would miss something important! Born to Russian-Jewish immigrants in 1913 Joe endured terrible poverty and personal hardships while growing up. His father died a year after he was born and the family was constantly short of money. When Joe was 12, he lost an eye due to a medical problem. An elder sister was lost to TB in squalid circumstances and other family members existed in equally dire circumstances. Yet despite these situations politics also seemed a constant. Through his father's first wife, Joe had an elder brother he never met, who returned to Russia to take part in the Revolution. Dave had been a Bolshevik supporter, but later joined the "Workers Opposition" and eventually left Russia to live in Paris. Other snapshots of family and friends who drifted in and out of the East End socialist and political milieu are described in detail throughout the book. Joe's own introduction to politics came in 1925 when he was 12 and stumbled across a demonstration in support of the Jewish Bakers' Union. Joe described his feeling as akin to a drug addict's first fix: "I was elated . . . most certainly something had entered my bloodstream." Joe's also described being "profoundly affected" by the General Strike in 1926, especially after witnessing mounted police attacking a crowd with sticks. But it was in the Communist Party that Joe was to earn his political stripes. He was a loose contact of the party, before joining the YCL. and later the adult party. It was to become the centre of his life. Joe vividly describes the tremendous variety of activities and organizations in which the Communist Party was involved. It is hard for those of us active today, particularly in North America to imagine the kind of influence the CP wielded. Significant also is the way he viewed the party. Several references to Trotsky and oppositionists are mentioned yet Joe refused to even read their words: "Might as well ask a Catholic to read Maria Sopes, when the Church had said he must not." He accepted the party's belief that they were traitors, and even the Moscow trials, although they were harder to swallow. But after all they had confessed hadn't they? Yet Joe was often considered a trouble maker in his branch. Throughout the latter part of the book, he paints a picture of the struggle in the branch between those who wanted to work through the trade unions and those who looked to alternative organizations and street work to advance the party's message, each brandishing Marx and Lenin to support their positions. Joe was a supporter of the latter group and was labelled an ultra-leftist by his colleagues. No account of life in the East End in the 30's would be complete without a mention of the "Battle of Cable Street." The announcement by Oswald Mosley and his British Union of Fascists that they would march through Cable Street on Sunday, October 3 and the efforts to prevent it have become the stuff of (C P) legend. The Fascist movement in Britain, while it never gained the influence that it achieved in continental Europe was certainly growing. Mosley's march was a provocation. Yet, despite the wave of popular indignation, and later CP accounts, the Communist Party initially decided to press on with their already announced demonstration for solidarity with Spain at Trafalgar Square on the same day. A letter from a CP leader to Joe stated that if "Mosley decides to march let him." Organizing around the slogan ‘They Shall not Pass' was deemed to be a stunt! When it became evident that the people of the East End were going to resist Mosley whatever the CP's position the party switched gears. Mosley never got to Cable Street. The Metropolitan police, watching the massive display of force and resistance called off the demonstration and Mosley was forced away. Joe rightly commented that it was a defeat for Mosley courtesy of "Jews and Gentile alike." But Joe's connection to the CP was soon to be severed. 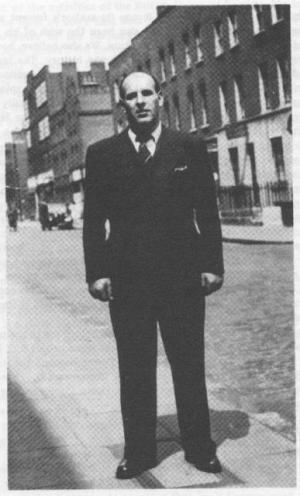 A little over a year after the events of Cable Street, Joe was expelled from the party. In 1951 he rejoined the party and although welcomed with open arms, he was expelled again within a year. Many accounts of working class activists come down to us via autobiography, but all too often the accounts are written by those who, in their youth, "were socialists too." Often their writings have the ring of hollow justification of their current activities. Happily Joe Jacobs' book does not bear this stamp. The main problem is that it ends too soon. Joe's untimely death in 1977 prevented him from writing, as he had planned to do, about more of his own past. Out of the Ghetto deserves a wide readership. "I am aware of the "ego-ethno-social- centrism" of any attempt to describe experience. This is not an exercise in "writing" History, only a witness account of what I and my friends were doing in a place which was a melting pot of political and other social activity. We radiated the results of our handling of events and influences which came into our lives in this unique place. I am not deliberately seeking to influence anyone toward an acceptance of my ideas, although these ideas to influence an unavoidably selective and incomplete account. With hindsight, you and I can make up our own minds about what is interesting, relevant or significant. Many of the problems we faced still exist. The story ends at the outbreak of World War Two, when I was only 26 years old. The next forty years transformed my ideas in a constantly changing world. To "Keep Your Head" simply means keeping up with these changes without getting too confused, or worse still completely lost. Survival is not only about physically keeping your head. It is also about the quality of survival. Is survival acceptable if it can only be secured at any cost to integrity and self-respect?" Originally published in Red & Black Notes #7, Winter 1999, this article has been archived on libcom.org from the Red and Black Notes website.